This article is about the political economist. For the 15th President of the United States, see James Buchanan. James McGill Buchanan Jr. (/bjuːˈkænən/; October 3, 1919 – January 9, 2013) was an American economist known for his work on public choice theory (included in his most famous work, co-authored with Gordon Tullock, The Calculus of Consent, 1962), for which he received the Nobel Memorial Prize in Economic Sciences in 1986. Buchanan's work initiated research on how politicians' and bureaucrats' self-interest, utility maximization, and other non-wealth-maximizing considerations affect their decision-making. He was a member of the Board of Advisors of The Independent Institute, a member (and for a time president) of the Mont Pelerin Society, a Distinguished Senior Fellow of the Cato Institute, and professor at George Mason University. Buchanan was born in Murfreesboro, Tennessee, the eldest child of James and Lila (Scott) Buchanan, a family of Scotch-Irish descent. He was a grandson of John P. Buchanan, a governor of Tennessee in the 1890s. He attended Middle Tennessee State Teachers College (since 1965 known as Middle Tennessee State University) in 1940 by living at home and working on the farm. Buchanan completed his M.S. at the University of Tennessee in 1941. He served in the United States Navy on the staff of Admiral Chester W. Nimitz in Honolulu during the war years, when he met Anne Bakke, whom he married on October 5, 1945. Anne, of Norwegian descent, was working as a nurse at the military base in Hawaii. She died in 2005. Buchanan identified as a socialist in his youth and was unaware of the University of Chicago's strong market-oriented approach to economics. His studies there, particularly under Frank H. Knight, converted him to "a zealous advocate of the market order". Buchanan received his Ph.D. from the University of Chicago in 1948 with a thesis on "Fiscal Equity in a Federal State", which was heavily influenced by Knight. It was also at Chicago that he first read and found enlightening the work of Swedish economist Knut Wicksell. Photographs of Knight and Wicksell hung on his office walls ever after. Buchanan was the founder of a new Virginia school of political economy. He taught at the University of Virginia from 1956–1968, where he founded the Thomas Jefferson Center for Studies in Political Economy. From 1955 to 1956 he was a Fulbright Scholar in Italy. He taught at UCLA 1968–1969, followed by Virginia Tech 1969–1983, where he held the title Distinguished Professor of Economics and founded the Center for the Study of Public Choice (CSPC). In 1983, a conflict with Economics Department head Daniel M. Orr came to a head, and Buchanan took the CSPC to its new home at George Mason University, where he eventually retired with emeritus status. He also taught at Florida State University (1951-1956) and the University of Tennessee. In 1969 Buchanan became the first director of the Center for the Study of Public Choice. He was president of the Southern Economic Association in 1963 and of the Western Economic Association in 1983 and 1984, and vice president of the American Economic Association in 1971. In 1988, Buchanan returned to Hawaii for the first time since World War II and gave a series of lectures later published by the University Press. Buchanan died January 9, 2013, in Blacksburg, Virginia, at age 93. The New York Times commented that the Nobel Prize-winning economist who championed public choice theory influenced a "generation of conservative thinking about deficits, taxes and the size of government". The Badische Zeitung (Freiburg) called Buchanan, who showed how politicians undermine fair and simple tax systems, the "founder of the new political economy". 1986: Nobel Memorial Prize in Economic Sciences for "development of the contractual and constitutional bases for the theory of economic and political decision making"
Buchanan's legacy lives on through a fellowship program at the University Honors College of Middle Tennessee State University. Buchanan's work focused on public finance, the public debt, voting, rigorous analysis of the theory of logrolling, macroeconomics, constitutional economics, and libertarian theory. Buchanan was largely responsible for the rebirth of political economy as a scholarly pursuit. 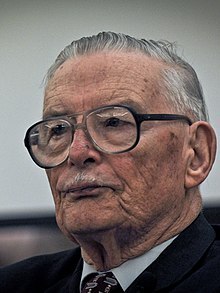 He emphasized that public policy cannot be considered solely in terms of distribution, but is instead always a matter of setting the rules of the game that engender a pattern of exchange and distribution. His work in public choice theory is often interpreted as the quintessential instance of economics imperialism; however, Amartya Sen has argued that Buchanan should not be identified with economics imperialism, since he has done more than most to introduce ethics, legal political thinking, and indeed social thinking into economics. Crucial to understanding Buchanan's system of thought is the distinction he made between politics and policy. Politics is about the rules of the game, where policy is focused on strategies that players adopt within a given set of rules. "Questions about what are good rules of the game are in the domain of social philosophy, whereas questions about the strategies that players will adopt given those rules is the domain of economics, and it is the play between the rules (social philosophy) and the strategies (economics) that constitutes what Buchanan refers to as constitutional political economy". Buchanan's important contribution to constitutionalism is his development of the sub-discipline of constitutional economics. According to Buchanan the ethic of constitutionalism is a key for constitutional order and "may be called the idealized Kantian world" where the individual "who is making the ordering, along with substantially all of his fellows, adopts the moral law as a general rule for behaviour". Buchanan rejects "any organic conception of the state as superior in wisdom to the citizens of this state". This philosophical position forms the basis of constitutional economics. Buchanan believed that every constitution is created for at least several generations of citizens. Therefore, it must be able to balance the interests of the state, society, and each individual. Buchanan's work Cost and Choice (see below in List of publications) is often overlooked for its contributions in defining the parameters of opportunity cost. In it, he writes that the costs to individuals determine what the price of a good or service is. For example, the physical work that is required to hunt an animal as well as the price of the tools necessary to hunt it and the time spent hunting all play a factor in the price an individual places on the meat. The asking price of the meat will vary from person to person because the input costs required for each person are not the same. Buchanan is considered to be a quasi-member of the Austrian school of economics, not formally associated with the school but sharing many common beliefs. As Buchanan puts it: "I certainly have a great deal of affinity with Austrian economics and I have no objections to being called an Austrian. Friedrich Hayek and Mises might consider me an Austrian but, surely some of the others would not." Buchanan went on to say that: "I didn't become acquainted with Mises until I wrote an article on individual choice and voting in the market in 1954. After I had finished the first draft I went back to see what Mises had said in Human Action. I found out, amazingly, that he had come closer to saying what I was trying to say than anybody else." James Buchanan is considered the architect of public choice theory. In fact, his work within Public Choice earned him the Nobel Prize in Economic Science in 1986. Public choice theory focuses on people's decision making process within the political realm. Buchanan used both the fields of economics and political science to help develop Public Choice. The same principles used to interpret people's decisions in a market setting are applied to voting, lobbying, campaigning, and even candidates. Buchanan maintains that a person's first instinct is to make their decisions based upon their own self-interest. Buchanan explains public choice theory as "politics without romance" because, he says, many of the promises made in politics are intended to appear concerned with the interest of others, but in reality are the products of selfish ulterior motives. According to this view, political decisions, on both sides of the voting booth, are rarely made with the intention of helping anyone but the one making the decision. Buchanan argues that by analyzing the behaviors of voters and politicians that their actions could become easily predicted. In 2017, Nancy MacLean published Democracy in Chains: The Deep History of the Radical Right's Stealth Plan for America. Her book claims that Buchanan saw a conflict between "economic freedom and political liberty", and that he sought "conspiratorial secrecy" in pursuit of "a hidden programme for suppressing democracy on behalf of the very rich". The book has garnered heavy criticism from both libertarian and non-libertarian writers for its perceived flaws in the use of quotes, sources, and the accuracy of its overall thesis. Political scientists Henry Farrell (of George Washington University) and Steven Teles (of Johns Hopkins University) described the book as "conspiracy theory in the guise of intellectual history." In a review by economists Jean-Baptiste Fleury and Alain Marciano in the Journal of Economic Literature, they write, "MacLean's account is marred by many misunderstandings about public choice theory" and "in the midst of abundant archival material, her historical narrative is, at best sketchy, and is replete with significantly flawed arguments, misplaced citations, and dubious conjectures. Overall, MacLean tends to overinterpret certain aspects in Buchanan's life and thought, while she overlooks others that are equally important in understanding his work and influence." In particular, the claim that Buchanan supported segregation has been disputed as untrue and contradicted by evidence that MacLean's book omits. Buchanan played a key role in bringing prominent South African apartheid critic William Harold Hutt as guest lecturer to the University of Virginia in 1965, during which he also sharply condemned Jim Crow laws. A listing of Buchanan's publications from 1949 to 1986 can be found at the Scandinavian Journal of Economics, 1987, 89(1), pp. 17–37. ^ a b c d Charles W. Baird. "James Buchanan and the Austrians: The Common Ground" (PDF). Object.cato.org. Retrieved July 15, 2017. ^ "Mont Pelerin Society Past Presidents". Mont Pelerin Society. Retrieved September 4, 2018. ^ Reuben Kyle, From Nashborough to the Nobel Prize: The Buchanans of Tennessee (Murfreesboro: Twin Oaks Press, 2012). ^ "Ideological Profiles of the Economics Laureates". Econ Journal Watch. Retrieved February 17, 2016. ^ a b c McFadden, Robert D. (January 9, 2013). "James M. Buchanan, Economic Scholar and Nobel Laureate, Dies at 93". The New York Times. Retrieved August 25, 2016. ^ William C. Mitchell (1988). "Virginia, Rochester, and Bloomington: Twenty-Five Years of Public Choice and Political Science". Public Choice. 56 (2): 101–19. doi:10.1007/BF00115751. ^ "Nobelpreisträger James M. Buchanan ist tot". Badische Zeitung (in German). January 9, 2013. ^ Peter Boettke, "James M. Buchanan and the Rebirth of Political Economy", in Against the Grain: Dissent in Economics, ed. S. Press and R. Holt (Aldershot, UK: Edward Elgar Publishing, 1998), pp. 21-39. ^ R. Swedberg, Economics and Sociology: On Redefining Their Boundaries (New Jersey: Princeton University Press, 1990), p. 263. ^ Lee, Dwight R. (2012). Public Choice, Past and Present: The Legacy of James M. Buchanan and Gordon Tullock. Springer Science & Business Media. ISBN 9781461459095. ^ "Constitutional Economics" (PDF). Retrieved July 15, 2017. ^ Buchanan, J., Logical Formulations of Constitutional Liberty, Vol. 1, Indianapolis, 1999, p. 372. ^ "An Interview with James Buchanan". Mises.org. Ludwig von Mises Institute. July 30, 2014. Retrieved July 15, 2017. ^ Monbiot, George (July 19, 2017). "A Despot in Disguise: One Man's Mission to Rip Up Democracy". The Guardian. Retrieved July 19, 2017. ^ Marciano, Alain; Fleury, Jean-Baptiste (2018). "The Sound of Silence: A Review Essay of Nancy MacLean's <em>Democracy in Chains: The Deep History of the Radical Right's Stealth Plan for America</em>". Journal of Economic Literature. 56 (4): 1492–1537. doi:10.1257/jel.20181502. ISSN 0022-0515. Atkinson, Anthony B. "James M. Buchanan's Contributions to Economics". Scandinavian Journal of Economics, 1987, vol. 89, no. 1, pp. 5–15. Pittard, Homer. The First Fifty Years, pp. 136, 173. Murfreesboro, TN: Middle Tennessee State College, 1961. James M. Buchanan (1919–2013). The Concise Encyclopedia of Economics. Library of Economics and Liberty (2nd ed.). Liberty Fund. 2013. Editors, Biography.com (2015). "James M. Buchanan Biography". bio. A&E Television Networks. Retrieved April 26, 2016.